Mobile Workstations are a convenient and efficient way to transport your order packing stations and shipping workstations to any location in the warehouse. The functionality offers a complete, mobile solution including software and mobile computing hardware. We offer a range of mobile workstations – from entry-level to heavy-duty units, customizable features and accessories that enable your workstation to suit your specific needs. 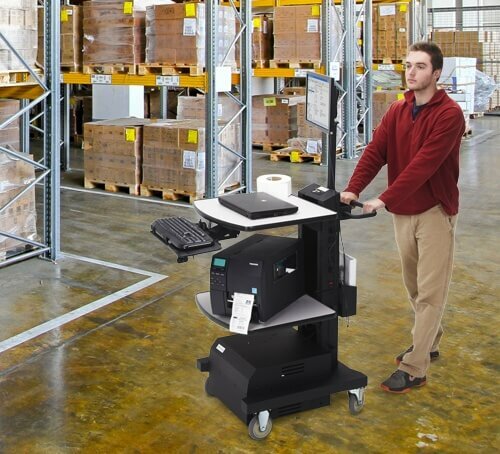 Entry-Level “EcoCart” Powered Workstations – Economical, compact utility cart for retail, warehouse/distribution and more. This lightweight, compact unit is ideal for powering a laptop, barcode printer and scanner for 8+ hours at time. Mid-Range “NB Series” Powered Workstations – Fully mobile workstation to meet the needs of retail, warehouse/dc and more. 24″ x 22″ work surface, integrated power strip, power package, adjustable shelves, etc. Heavy-Duty “PC Series” Powered Workstations – Consists of 30″ and 48″ deep workstations that are designed for ease of mobility. Integrated power strip, power package, adjustable shelves and more. Workstation Accessories – Full line of accessories that can be integrated to any cart series in seconds to create a highly functional mobile equipment workstation. Stand-Alone Power Packages – Competitively-priced units that consist of an inverter, smart charger, battery, battery status meter and ventilated cabinets. Advanced Mobile Group can provide your company with partial or complete mobile workstation solutions, and will work with you to determine the best solution for your warehouse. Contact us to learn more about our mobile workstations solutions.